Don’t see the AutoFill button? Make sure you are on an UnPublished week. -Some multi-week schedule views do not have an AutoFill button. -Your main manager may not have set your permissions to allow you to AutoFill. 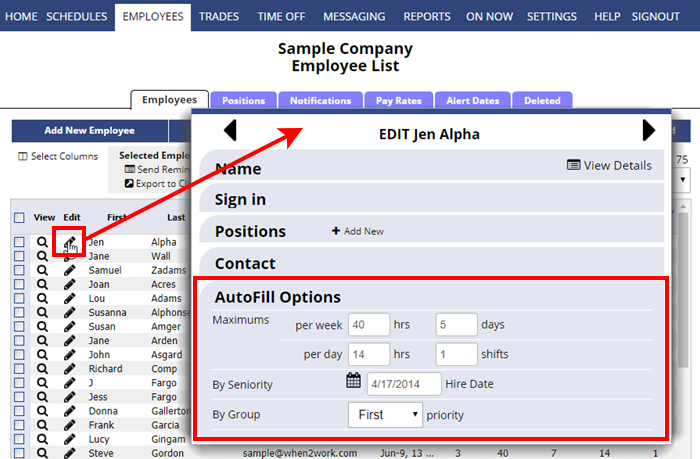 You can set each employee’s daily and weekly maximums for AutoFill. The system defaults to 40 hours/7 days per week and 1 shift/14 hours per day. If the columns for Maximum Hour/Shifts are not showing in the grid, click the “Select Columns to View” link in the upper left and check off those columns so they appear in the grid. Check off employees and click the “Bulk Edit” link to edit and enter new maximums and click Save. Click in grid to make changes and click Save. In the AutoFill Settings area, change the settings as needed. Note: if you want to allow AutoFill to assign split shifts, be sure to change the Shifts/Day to more than one. The next time you use AutoFill those maximums will be used. Using Equal Priorities (Default) – This is the option used by most companies – all employees are treated the same. AutoFill will assess the best schedule with everyone in mind – trying to distribute the shifts as evenly as possible within each employee’s maximum hours/shifts/days and based on their work time preferences (prefer, dislike & cannot work). By Priority Group – Takes employees in Group One – gives all of them their best possible schedule based on their work time preferences (up to their maximum hours per week) and then takes the next group and schedules them with their best possible schedule up to their maximums, etc. By Seniority (Hire Date) – Takes the most senior employees (with oldest hire date) and gives them their most preferred schedule, then takes the next most senior employee and fills in with their best schedule, etc. You also have the option to ignore employee “prefer and dislike hours” and “Position Preferences” when you AutoFill. When these are checked, AutoFill does not consider any employee “prefer” and “dislike” time preferences or position preferences that have been entered for employees. You can AutoFill, then Clear the assignments and AutoFill again to try out the different options. AutoFill is designed to have a randomizing effect so that if you were to repeat AutoFill for the same schedule, you may get slightly different results. 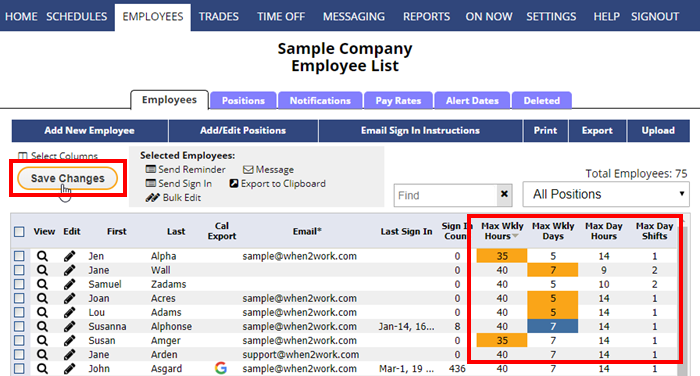 (If any employee has entered work time preferences, then AutoFill will not schedule as randomly because it will repeatedly accommodate those few preferences added). You can visually compare your shift assignments to employee preferences and constraints by going to the Grid View or Sortable List view and clicking the Analyze button.